Live Aquarium Plants Care - Easy or Not? Aquarium plants are more than fish tank decorations; they require care and will reward you for that care. The first thing you should find out is how much and what type of light your plant needs. Florescent bulbs are the most common bulbs for lighting aquariums. These bulbs come in a variety of UV intensities and can be switched out without changing equipment. Some live aquarium plants require heavy light exposure, a metal halide bulb work well in these cases. Although, metal halide bulbs use a lot of electricity and may be too much for some fish. Either way it is best to find out what type of lighting is required before buying any live aquarium plants. 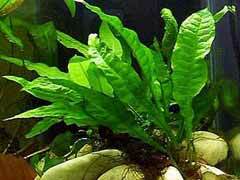 Unlike other aquarium ornaments, live plants need certain nutrients in the water to survive. It is always a good idea to find out what nutrient levels your plant will need. If you have enough fish in your tank you shouldn’t need to add any of these nutrients to the water. For smaller tanks or tanks with less fish it is best to be sure needed additives will not harm your fish. Test your water often to be sure these nutrient levels stay safe when adding them to your water. Although there are some free floating aquarium plants, most require a substrate for root burial. This can be sand or small rocks. Many plants that require burial will come with a small sponge like ball inside a small plastic container. This acts like a flower pot and should be left on the plant when burying. This will encourage root growth even further.